20. X-Men: Misfits (Raina Telgemeier, Dave Roman & Anzu) - Say what you will - this is a damn good comic. I wasn't expecting much from this title when I first picked it up, but it really won me over, and is a first-rate example of a reimagining done to fantastic results. Perhaps it's the superhero fan in me, but I love the shojo elements warped from things already present in the X-Men universe, throwing girl-next-door Kitty Pryde into a school populated by mutant boys who are fashion-forward and often oversexualized, with a good amount of humor and tension thrown into the mix. 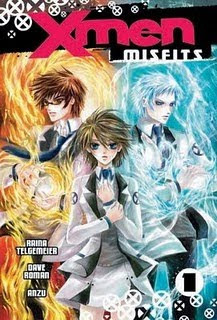 Some manga readers may be put off by the superhero invasion into the manga format, and some superhero fans may be aghast at the transformations of their beloved universe, but I was, happily, very pleased with the imaginative result of the creators, and was constantly excited to see what else they had in store for the mutants. The art is also executed to great results, from the designs of the reimagined characters to the clear action. I often gazed at panels for awhile before moving on, particularly early scenes of Kitty phasing through walls and floors (and there's one later scene of her phasing through the mansion wrapped in Pyro's arms). This book is just an utter treat and I have no qualms with naming this one of my favorite books of the year because I loved every moment of it. 19. S.W.O.R.D. (Kieron Gillen & Steve Sanders) - S.W.O.R.D. is a fantastic new comic book series with a great premise. 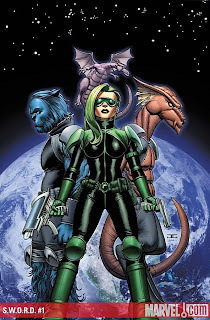 Spun out of Joss Whedon and John Cassaday's excellent run on Astonishing X-Men, Agent Brand is running the Sentient World Observation and Response Department, the government's answer to threats from outer space, a compliment to their S.H.I.E.L.D. division. With a fun crew of characters, including Beast and Lockheed, this book is one of the funnest comics I've read in a long time, with a great balance of action, humor and verbal sparring, with clear storytelling courtesy of Steve Sanders. Brand's battle with Death's Head is an instant classic. I hope plenty of people come onboard for this series, because only two issues in, it's already got the makings of a great. 18. Swallowing the Earth (Osamu Tezuka) - While Swallowing the Earth was written during a transition period for the god of manga, that of his tales moving from children's stories to that of the more serious, mature works of his later life, Swallowing the Earth is still a very rich tale where Tezuka has a lot to say about society, greed, government and gender inequality. It's a story epic in scale, beginning with smaller events and mysteries that slowly spiral passed the sum of its parts into a whirlwind of disaster for the world's economy and governments, complete with plots of revenge and unexpected love. Tezuka populates his beautifully-illustrated world with characters that are bursting with emotion and reactions to the odd situations they find themselves in. This book is top-notch and should really not be missed by anyone who considers themselves a fan of manga. 17. 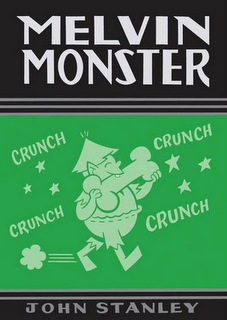 The John Stanley Library: Melvin Monster (John Stanley) - The first book in Drawn & Quarterly's line celebrating a cartooning legend, The John Stanley Library, features a little green monster named Melvin who lives in Monsterville with his Mummy and Baddy, and wants nothing more than to be a good boy, much to the chagrin of his parents. To be honest, it took a few comics to grow on me, but once it did, it wasn't too hard to see why people have enjoyed these stories for decades. This is a really cute comic, with obvious echoes of Casper the Friendly Ghost, with clear storytelling and top-notch cartooning. It may seem a little old-fashioned, but I think it holds up really well and kids anywhere would probably love to read this sort of book. I know I certainly did. It's just a charming premise with plenty of opportunities to do fun, imaginative things with, which Stanley obviously realized and took advantage of with endearing ongoing gags and a feisty little protagonist. 16. The Walking Dead (Robert Kirkman & Charlie Adlard) - Things that had been brewing for volumes finally came to a head in The Walking Dead post-apocalyptic zombie comic. Brutal and unrelenting, no one was safe in a year that saw humanity's worst come out in the survivor's of Kirkman's world, particularly in the form of the villainous Governor. I like how this book focuses on how the survivors make out amid the devastation, carrying on the human race in pathetic tatters. Things just keep getting more desperate in this series, with slim glimmers of hope through the heart-breaking scenes and earth-shattering events. 15. 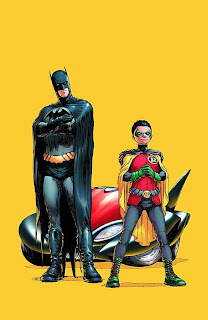 Batman and Robin (Grant Morrison, Frank Quitely & Philip Tan) - When Grant Morrison and Frank Quitely work on a project together, they execute really great ideas to spectacular results. Morrison's stories are both weird and classic at the same time, and are always full of lots of energy and enthusiasm, and Quitely perfectly executes the writer's vision. Unfortunately, Quitely is not the only artist on this series. I wish that weren't the case because he seems the most capable of conjuring up the iconic, impactful images that Morrison envisions. And while Tan does a compentent job, what artist could really follow up Quitely without some criticism? But that being said, I love the dynamic between the new Batman and Robin, as they've really breathed a fresh breath of air into the tired relationship of student and mentor. 14. 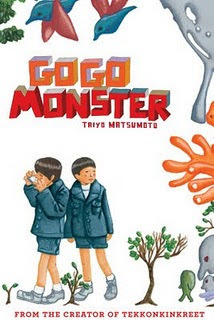 (TIE) GoGo Monster (Taiyo Matsumoto) - Easily boasting the best packaging for a manga this year, GoGo Monster stands out on a bookshelf with a handsome design, and with a story just as rich. Inside, you'll find quirky characters, particularly Yuki Tachibana, who may or may not have a gift to communicate with spirits at his elementary school. This book is a vivid, slow-building work with an utterly compelling story. It's the kind of book that sent shivers up my spine, with some nightmarish images that won't soon be forgotten. A strong, creative vision from a talented creator unafraid of putting difficult, lasting material out there. 14. (TIE) Cat Burglar Black (Richard Sala) - This mystery featuring a teenager raised as a master thief by a horrible matron at an orphanage, is full of action and drenched in Gothic atmosphere. Sala is amazing at spinning this sort of suspenseful tale, quirky and strange and very reminiscent of my favorite Sala work Peculia. The addition of color is used to nice effect in this latest effort, which is executed fluidly and paced to perfection. 13. 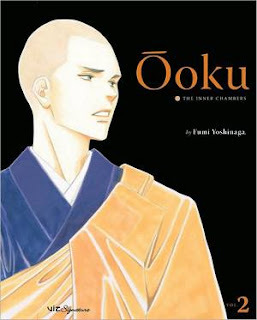 Ooku: The Inner Chambers (Fumi Yoshinaga) - From the creator of Antique Bakery comes a tale that imagines an alternate history for Japan during the Edo Period. During this time, a plague wipes out most of the male population, forcing women to take on roles formerly held by men, including the role of shogun. To protect the royal lineage, the shogun's inner chamber has been converted to house the most beautiful men in the country, where they serve her until death. The premise is creative and very rich, making for some intense, fascinating stories. And Yoshinaga illustrates the tale masterfully with soft, beautiful lines. 12. Honey Hunt (Miki Aihara) - Honey Hunt is a shojo manga from the creator of Hot Gimmick, that follows the daughter of cold, distant celebrity parents. To be taken seriously and meet her mother on her own turf, Yura strives to become an actress to rival her mother's abilities in a manga full of some really messed-up characters. It may contain some echoes of Ai Yazawa's Nana, but this series is so well-executed and beautifully-crafted that I can't help but be utterly addicted to the title, constantly on the lookout for the next installment to come out. 11. 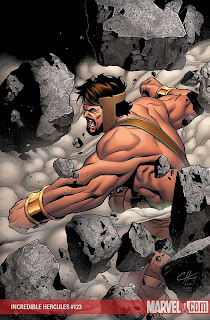 The Incredible Hercules (Greg Pak, Fred Van Lente, Clayton Henry, Salva Espin, Rodney Buchemi, Dietrich Smith, Ryan Stegman & Takeshi Miyazawa) - Greg Pak and Fred Van Lente know how to write a great straight-forward superhero book. I never really expected to like a book like this, featuring a big oaf with brute strength as a protagonist, with a smart nerdy sidekick. Sure, there are some flaws in the storytelling, and it may be a little hard to put into words what I like about it so much, but I just love reading it. The stories are great: battles with Amazons, teaming up with Namora, going on an odyssey with other gods to take down a skrull god...they're just a lot of fun and I really look forward to reading more. If it weren't for the word-of-mouth this book has been getting, I probably never would have picked it up. I'm just happy that some others see it for what it is. 10. The Collected Doug Wright: Canada's Master Cartoonist (Doug Wright) - This archival collection features a very talented and genuinely funny cartoonist, the likes of which you'd be hard-pressed to find in the funny pages today. Doug Wright's Nipper strips are presented here in a beautiful overall package, courtesy of Seth and Bob Mackay, with an introduction by Lynn Johnston, and plenty of supplementary material. Wright perfectly captures suburban life of the past with his mischievous Nipper and the neighborhood he vividly brings to life through his short, wordless tales. 9. 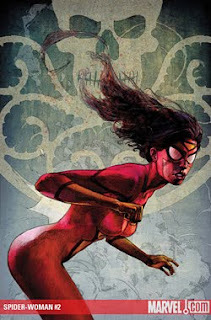 Spider-Woman (Brian Michael Bendis & Alex Maleev) - Bendis and Maleev's new Spider-Woman ongoing series is a very dark book, featuring a troubled protagonist who is having a hard time adjusting to a post-Secret Invasion world, as well as her abduction and subsequent replacement during the event. I love Maleev's art. It's very gritty, but beautiful, rendering Jessica Drew and her various locales with plenty of detail and thoughtfulness, using color to fantastic effect. I think Maleev's style on this title is one of the reasons I felt a strong sense of deja vu with Bendis' Alias, which was drawn by Michael Gaydos, and was also dark with similar pacing. In this book, Jessica Drew uses her detective skills (and superhero background) as an agent of S.W.O.R.D., hunting down alien threats (of the skrull variety), which makes sense given her recent history. Drew's various affiliations of the past also make for fun conflicts, as Hydra comes into the fold very quickly, and her loyalites are, as always, tested. Jessica Drew hunting down skrulls is a great hook in itself and so far, it's been executed in such a high quality way that it's earned the top slot for a superhero title on this list. 8. West Coast Blues (Jacques Tardi) - Adapted from the novel by Jean-Patrick Manchette, French cartoonist Jacques Tardi brings to life a crime story unlike the kind that readers are familiar with. Gone are the expected gritty noir elements, replaced by a story that subverts expectations at every turn and features a protagonist who does whatever the hell he wants. Fantagraphics is just beginning to adapt Tardi's graphic works for American audiences, beginning with this gem, giving the gift of a talented cartoonist who isn't afraid of showing readers a wild ride with uneven pacing, a wide range of lively characters, and fantastic illustrations of both fast-paced action and the slow moments of domestic life. Tardi is a master at drawing out suspense and offers one unique reading experience with this amazing work. 7. 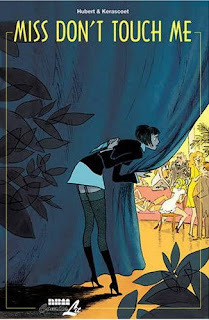 Miss Don't Touch Me (Hubert & Kerascoet) - Another French graphic novel, this one comes from writer and colorist Hubert, and Kerascoet, a husband-wife art team who reminded me very much of Joann Sfar, with pencils that are loose, willowy and expressive. This book kind of does several different things, and to fantastic effect, but ultimately, this is a murder mystery. Someone is cutting women to pieces in 1930's Paris, dubbed the Butcher of the Dances, and those murders prompt Blanche to eventually enlist with a high-class bordello in order to get closer to the truth behind them. She adopts the role of Miss Don't Touch Me, a stern pain-inducing English governess, and witnesses behavior that scandalizes her. It's interesting to see what this character will do to satisfy her questions, and how far she will compromise herself to uncover the truth. This book is full of terrific environments and secondary characters who come into their own along the way, each with quirks and oozing personality. 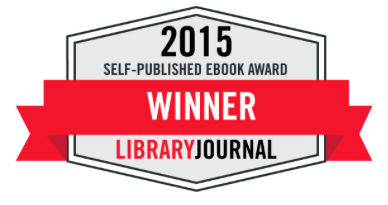 This book has mystery, horror, drama, suspense and is completely riveting throughout. 6. A Drifting Life (Yoshihiro Tatsumi) - Telling the story of his life, manga giant Yoshihiro Tatsumi also paints a history of manga for readers in this massive autobiography. Tatsumi was immersed in the manga world from a young age, and as such, had a special view of the development of the medium, and being a master cartoonist, helped to shape it into what it is today. Through this chronicle, Tatsumi captures the struggle of a blossoming artist, with all of its hardships and rewards alike, as he strives to follow in the footsteps of his hero, the great Osamu Tezuka. This book is insightful, inspiring, and you can see his love for manga on every page of this great work. 5. 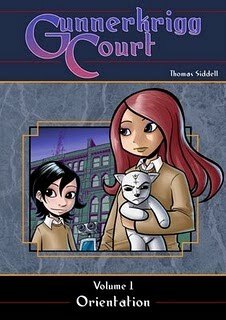 Gunnerkrigg Court (Vol. 1): Orientation (Thomas Siddell) - This award-winning webcomic saw print for the first time through Archaia earlier this year, expanding the book's readership to include people such as myself who don't read too many comics on-line. This all-ages fantasy follows Antimony Carver, a fully-realized heroine who attends a strange school with magic and mystery around every corner, and danger waiting in the wings. The stories of this first collection begin small and slowly build toward a more epic pitch, much like the art begins a little shaky and you can see Siddell grow confident in illustrating his world as he proceeds, taking those few great cartooning moments from the initial chapters and turning out consistently skilled, smooth art by its end. I just could not believe how quickly I fell in love with this world and the characters who maneuver through it. It's not too often that something so magical and engrossing as this comes along, but I think Gunnerkrigg Court will surprise many people who pick it up. 4. 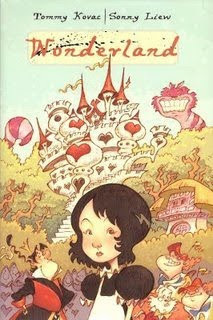 Wonderland (Tommy Kovak & Sonny Liew) - Fun, witty and just plain gorgeous, Tommy Kovac and Sonny Liew continue Disney's version of Lewis Carroll's Alice In Wonderland with familiar faces, as well as some new ones. The protagonist of this new tale is Mary Ann, the White Rabbit's maid whom he mistakes Alice for in the original story. Mary Ann is a no-nonsense maid who happens to be obsessive-compulsive about making things pristinely clean. If she gets dirty, she gets a little crazy - if she sees a dirty dirt road, she'll dust like no tomorrow. She's utterly likable and is drawn beautifully, as is the rest of the book, by Sonny Liew with delicate lines and cartoony characters, in stunning colors. Kovac came up with some pretty imaginative ideas for this sequel of sorts, touching on the fate of the royalty from other suits of cards, and reintroducing favorites like the Mad Hatter and the Cheshire Cat, and a butterfly-morphed caterpillar. This book is brimming with creativity and you have to pause to admire the artwork often, while taking in fun panel arrangements and the craziness that comes with this backwards world that Alice left behind (and the repercussions of her visit are felt in every corner of Wonderland). This is just an absolute treat for readers of any age. 3. Pluto (Naoki Urasawa, Based on Astro Boy by Osamu Tezuka) - My highest ranked manga sees master of suspense Naoki Urasawa reimagining Osamu Tezuka's world from the classic Astro Boy story "The Greatest Robot on Earth" in a realistic fashion, updating the beloved character in a story that's drawn out to let the characters live and breathe in a fully-realized environment. Urasawa has a real gift for pacing, which fans of the creator have experienced since Monster first began to be translated into English a few years ago. 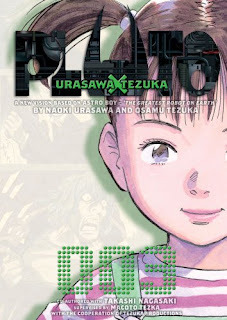 With Pluto, Urasawa takes that pacing to a whole new level, injecting genuine suspense, a complex mystery and characters that develop before readers' eyes in a story that the master artist teases out for fans, leading to big reveals and making moments (like the introduction of Atom) seem that much cooler. Urasawa also happens to be one stunning illustrator, making for some beautiful action scenes (or hell, just beautiful talking heads) amid some of the most crystal-clear storytelling out there. The overall package is a manga nearly perfect on every level. 2. 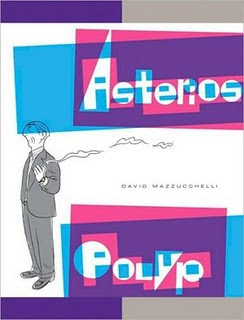 Asterios Polyp (David Mazzucchelli) - Asterios Polyp is a perfect example of a creator really taking the reigns of the medium of comics, using it to do things that can not be done in any other medium, and executing his vision to superb effect. Mazzucchelli really proves his mastery over cartooning, using panels to create suspense and mood, and conveying a story through his art that showcases original ideas, with characters that are all flawed, three-dimensional and brilliantly handled. And when the artist's ideas are conveyed through the lines and squiggles and colors to get across a philosophy he has, followed by readers watching that play out with the characters through the book, it really becomes something special. Mazzucchelli has an eye for how to use simple techniques to add impact to a scene, often making seemingly ordinary circumstances seem extraordinary, and intensifying the emotions surrounding them. I really enjoyed the experience of reading this book and devouring a work lovingly and thoughtfully crafted especially for the medium that I love. 1. 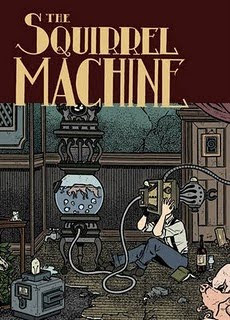 The Squirrel Machine (Hans Rickheit) - A quirky, beautiful, sometimes frightening graphic novel, The Squirrel Machine is a stunning tale about two shunned brothers living in a small town and the grotesque art that they create that the townsfolk don't understand. It has a really eerie vibe all throughout, with some disturbing images that could have easily stumbled right out of a David Lynch film, culminating in some pretty shocking scenes. But the story is oddly sort of touching, despite the overt oddness of the brothers. There are some panels of the book that I'm still not sure what to make of, or how I feel about them, like one of my favorites of one of the brothers dressed in nothing but a boar's head covering his own, and some sort of a musical device with a crank covering his privates, with a proper young woman reaching out to touch it. It feels wrong, but is still very striking, and the whole book raises a range of emotions in me that often contradict one another. But one thing can very easily be said about this graphic novel, and that is that Rickheit's art is phenomenal. From the arrangement of panels, to the elaborate designs of the brothers' creations and the secret rooms of the mansion they live in, to the execution of the characters as they move through environments full of atmosphere and often, a good amount of tension. The Squirrel Machine is a haunting story that won't soon leave readers, with many images left burned in this reader's mind. And it's quite deserving of the title of best comic of the year. I can't say I've read any of these! Wonderland's been on my list because I'm a fan of Alice in Wonderland in general, but to see a take on it ranked so high is exciting. Great list-I'll definitely be keeping my eye out for many of these. I hadn't heard of Squirrel Machine before -- I'll definitely check it out, thanks. I love my new Nativity Scene!